Deprescribing is the planned and supervised process of dose reduction or stopping of medication that might be causing harm or that might no longer be providing benefit.1 The goal of deprescribing is to reduce medication burden and harm while maintaining or improving quality of life. However, deprescribing can be difficult, especially when medications do not appear to be causing overt harm.2 In an effort to provide evidence-based recommendations and tools to aid clinicians in reducing or stopping medications that might no longer be needed or that might be causing harm, we initiated the Deprescribing Guidelines in the Elderly project (www.open-pharmacy-research.ca/research-projects/emerging-services/deprescribing-guidelines). Antipsychotics are commonly used in the elderly, particularly in those residing in long-term care (LTC) facilities, to control certain behavioural and psychological symptoms of dementia (BPSD) including delusions, hallucinations, aggression, and agitation when there is potential for harm to the patient or others.4 A 2014 meta-analysis demonstrated statistically significant improvements in symptoms of BPSD as measured using 5 different scales for patients taking atypical antipsychotics compared with placebo.5 However, antipsychotic treatment initiated for BPSD is often continued chronically, despite a lack of documented ongoing indications for many patients. Because behavioural features of dementia change over time as the disease progresses,6 it is important to reassess the continued need for treatment. Our primary target audience includes Canadian primary care and LTC physicians, pharmacists, nurse practitioners, and specialists who care for patients taking antipsychotics. Our target patient population includes elderly patients taking antipsychotics for the purpose of treating BPSD, for treating primary insomnia, or for treating secondary insomnia when the underlying comorbidities are managed. This guideline does not apply to those taking antipsychotics for the treatment of schizophrenia, schizoaffective disorder, bipolar disorder, acute delirium, Tourette syndrome or tic disorders, autism, mental retardation or developmental delay, obsessive-compulsive disorder, alcoholism, cocaine abuse, or Parkinson disease psychosis; to those taking them as an adjunct for the treatment of depression; or if psychosis in patients with dementia has been treated for less than 3 months’ duration. The Guideline Development Team (GDT) comprised 9 clinicians (4 pharmacists [B.F., L.M., L.R.W., C.R.F. ], 2 geriatricians [G.L., S.S.], 1 family physician [L.M.B. ], 1 geriatric psychiatrist [A.W. ], and 1 family physician specializing in LTC [L.G.]) and a Cochrane methodologist (V.W.). Expertise, role descriptions, and conflict of interest statements are available at CFPlus. * We selected a guideline chair (L.M.B.) based on expertise in pharmacoepidemiology and in primary care clinical medicine. A Canadian Library of Family Medicine librarian conducted searches in collaboration with 1 staff member (M.H.). We used the GRADE (Grading of Recommendations Assessment, Development and Evaluation) system for guideline development (Box 1).17–20 We generated 2 clinical management questions using the PICO (population, intervention, comparison, outcome) approach: What are the effects (harms and benefits) associated with deprescribing compared with continuation of antipsychotic medication for the treatment of BPSD in adults, and what are the benefits and harms associated with the treatment of insomnia with atypical antipsychotics? GRADE—Grading of Recommendations Assessment, Development and Evaluation. The GDT chair drafted recommendations based on the summaries of evidence, taking into account literature on patient preferences about antipsychotic use, a review of reviews of harms of continuing antipsychotic use, and resource implications (in terms of antipsychotic cost and costs potentially associated with stopping antipsychotics). Members reviewed the draft recommendations and discussed them in person and via teleconference. Voting on the recommendations was subsequently conducted anonymously by e-mail. Unanimous agreement was sought; 80% agreement (ie, 8 of the 10 GDT members) was considered the cutoff for consensus. All 10 members of the GDT agreed with the recommendations. The recommendations are outlined in Box 2. The algorithm developed for this guideline is provided in Figure 1. The GRADE evidence tables used to evaluate the evidence for each patient-important outcome can be found at CFPlus. * The rationale for the recommendations is outlined in Table 1.18 The recommendations apply to adults who have been prescribed antipsychotics for insomnia or for BPSD, provided the symptoms of the latter are controlled or the patient is unresponsive to a reasonable trial of therapy. The evidence base for deprescribing relates mainly to patients with BPSD but can be extrapolated to those with insomnia or when short-term use is generally adequate (eg, transient delirium or psychosis unrelated to BPSD). The recommendations do not apply to those who have been prescribed antipsychotics for the treatment of disorders such as schizophrenia, schizoaffective disorder, bipolar disorder, acute delirium, Tourette syndrome or tic disorders, autism, mental retardation or developmental delay, obsessive-compulsive disorder, alcoholism, cocaine abuse, or Parkinson disease psychosis; or as an adjunct in the treatment of depression; or for the treatment of delusions and hallucinations in patients with dementia. BPSD—behavioural and psychological symptoms of dementia. Based on the lack of evidence of the harm of deprescribing and the evidence for the benefit of reducing inappropriate antipsychotic use in terms of avoidance of the drug-related harms, the high societal cost of inappropriate antipsychotic use, the potential net cost benefit of switching to behavioural therapy, and the feasibility of an antipsychotic deprescribing intervention, we rated the recommendation to reduce or stop antipsychotic use for the treatment of BPSD as strong. Based on the lack of evidence for the efficacy of antipsychotics for treating insomnia, and the potential for harm and high cost, we rated the recommendation to eliminate antipsychotic use for the treatment of insomnia as strong. Combined with clinical judgment and an individualized approach to care, this guideline is intended to support clinicians and patients in successfully deprescribing antipsychotics, ultimately striving for better patient care. The following questions were articulated by the GDT as being important to consider when making decisions about the steps for deprescribing antipsychotics. Is there an indication and are there risk factors that warrant continued use? An important first step is to clarify when the antipsychotic was started and for what reason. This might require a chart review and discussion with the patient, caregivers, other prescribers (often other specialists), or pharmacist. If patients are using antipsychotics for insomnia, deprescribing is compelling, as there are no data to support antipsychotic use for this specific indication. Examples of patients in whom antipsychotics should be continued include those meeting exclusion criteria (eg, taking antipsychotics for psychosis), patients for whom repeated attempts have been made to deprescribe without success, and, in some cases, patients who recently started taking antipsychotics for BPSD and in whom it is too early to assess benefits and harms. What monitoring needs to be done and how often? It is important to clarify with the patient, family, and health care staff what specific symptoms are being treated, what the desired response to treatment is, and the need to monitor the actual response following antipsychotic initiation and, likewise, discontinuation. This might require a retrospective chart review with the aim of documenting changes in the frequency or severity of target symptoms. It might be of value to use an objective measure such as the Neuropsychiatric Inventory (NPI) subscales or the behavioural subscales of the Resident Assessment Instrument–Minimum Data Set tool to quantify the frequency and severity of the symptoms at baseline and follow these parameters through time. Response can be defined as a decrease of 50% in the 3 target symptoms (psychosis, agitation, aggression).32 Physicians and caregivers should also monitor for expected benefits of deprescribing (such as reduced falls and improved cognition, alertness, function, extrapyramidal symptoms, and gait). Close monitoring (eg, every 1 to 2 weeks) is essential during the tapering process, and the use of objective measures can be helpful in identifying any behavioural recurrence or withdrawal symptoms, as well as the success of deprescribing. Predictors of successful discontinuation of therapy include lower baseline severity of neuropsychiatric symptoms (NPI score < 15)33,34 and lower dosage of antipsychotic to achieve symptom control.22,35 Those receiving a higher dosage and those with higher NPI scores or higher global severity (as NPI or other tools are not commonly used) might require closer monitoring. Monitoring tools such as the Cohen-Mansfield Agitation Inventory, which is brief and easy to apply, might be more amenable to use for patients in LTC settings, where health care professionals are present.36,37 In the outpatient setting, family and caregiver involvement is key to monitoring behavioural recurrence, with close medical follow-up. How should symptoms be managed? External clinical review of the guideline was conducted by a pharmacist, a geriatrician, a family physician, and a nurse using the AGREE II (Appraisal of Guidelines for Research and Evaluation) Global Rating Scale tool.46 Relevant stakeholder organizations (eg, family practice, pharmacy, psychology, LTC) were invited to similarly review and endorse the guidelines (Box 4). Modifications were made to the original guideline draft to address reviewer comments. Existing clinical practice guidelines,43,47 including Canadian guidelines,29,44 as well as best-practice recommendations for older adults,40,48 consistently support the use of antipsychotics for BPSD only when patients are at risk of harming themselves or pose a considerable threat to others. 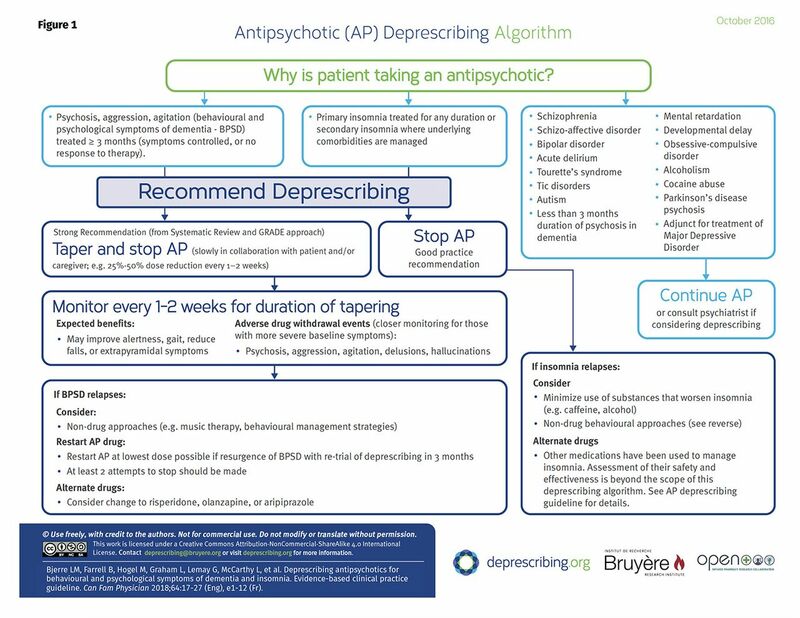 In a 2012 systematic appraisal of guidelines for BPSD, Azermai et al reported that only 2 of the 15 evaluated guidelines addressed discontinuation of antipsychotics.49 Both recommended deprescribing after 3 to 6 months of behavioural stability.49 More recent guidelines44,47 or evidence-based updates to guidelines acknowledge that antipsychotics prescribed for the treatment of BPSD can be safely withdrawn in many patients, and discontinuation should be attempted when symptoms are stabilized.43 There is no information in current guidelines to assist physicians with deprescribing approaches (eg, tapering or abrupt cessation). 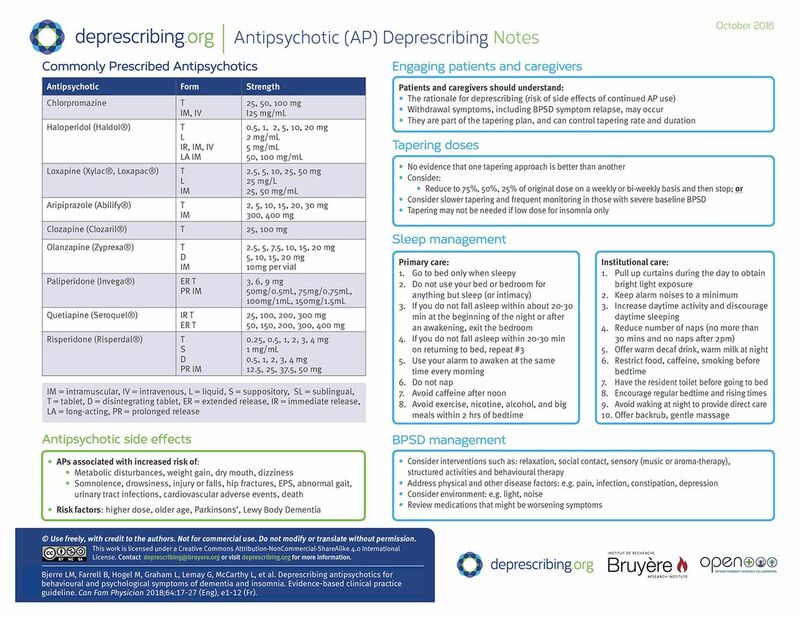 An antipsychotic deprescribing guideline supplements current treatment guidelines in offering clinicians recommendations and clinical considerations to support the deprescribing of antipsychotics after BPSD has been stabilized or following an appropriate trial without response to treatment. Despite the widespread use of antipsychotics, numerous gaps in knowledge exist that could alter the strength of the recommendations in this guideline. What are patients’ values and preferences regarding the use or deprescribing of antipsychotics for treating BPSD? Although there might be difficulties in obtaining reliable and usable data from this population, it is nonetheless a valuable perspective that should be included in weighing the benefits against the harms of using antipsychotics for BPSD. Such information would inform prescriber-patient-family discussions about BPSD treatment and deprescribing. What are the indirect costs or cost savings associated with deprescribing antipsychotics for the treatment of BPSD? These indirect costs could result from changed caregiver requirements—either increased, if symptoms worsen, or decreased, if patients become more independent with activities of daily living—when a patient’s antipsychotic medication is reduced or discontinued. In the case of the use of antipsychotics for treating insomnia, several additional pieces of evidence would have proven beneficial in weighing the benefits and harms of deprescribing. Are antipsychotics effective for treating insomnia? Only 1 study involving 13 participants was identified in the literature.23 Given that it showed modest but not statistically significant improvements in all 3 sleep outcomes, additional studies could strengthen the evidence for or against using antipsychotics for this purpose. What are the effects of deprescribing antipsychotics prescribed for the treatment of insomnia? What is the adverse effect profile of antipsychotics prescribed for the treatment of insomnia? Antipsychotics are generally taken at a lower dose for the treatment of insomnia than for other indications; however, the harms literature generally reports on antipsychotics used at higher doses. The adverse effect profile might not be the same in the case of insomnia. What is the most effective strategy for tapering or stopping antipsychotics? Direct comparison of different deprescribing approaches would be helpful to determine if there is a best approach. This evidence would improve prescriber confidence in taking a patient off an antipsychotic. Last, and falling outside the recommendations of this guideline, family physicians often see patients prescribed antipsychotics by psychiatrists for reasons other than BPSD or insomnia. Trials examining the outcomes of deprescribing antipsychotics for those with other conditions would prove beneficial to health care professionals weighing the harms and benefits of deprescribing in patients who might also be at higher risk of the adverse effects of continued antipsychotic treatment. The deprescribing team will endeavour to provide routine guideline updates as new evidence emerges that could change the recommendations. Prospective evaluation of the effects of the adoption of this and other deprescribing guidelines will be part of the research strategy in the future. Overuse of medication is acknowledged to be a key contributor to polypharmacy, with attendant negative effects on health. Antipsychotics are increasingly used for indications for which they are not licensed or for which they have not been studied, such as BPSD and insomnia, yet their potential for harm with long-term use is well established. A systematic review identified that antipsychotics can be safely deprescribed in many patients with BPSD.18 Our systematic review of antipsychotic use in insomnia19,20 did not identify any studies of discontinuation that could inform our present guideline; however, we were also unable to find evidence supporting the use of antipsychotics for treating insomnia in the first place, suggesting that patients receiving antipsychotics for insomnia should have them stopped. When deprescribing antipsychotics, patient, family member, and caregiver involvement is crucial. The evidence, tapering strategies, and associated algorithm presented in this current guideline are intended to support this process. This evidence-based guideline is one of a series of guidelines aimed at helping clinicians make decisions about when and how to safely stop medications. Implementation of such guidelines will encourage clinicians to carefully evaluate the ongoing use of medications and potentially reduce the negative effects of polypharmacy in the future. For their clinical review of the guideline and invaluable feedback, we thank Allison Bell, a pharmacist with the Winnipeg Regional Health Authority in Manitoba; Dr David Strang, a geriatrician with the Winnipeg Regional Health Authority; Dr John Crosby, a family physician practising in Cambridge, Ont; and Linda Hunter, former Chief Nursing Officer at Perley and Rideau Veterans’ Health Centre in Ottawa, Ont. ▸ Antipsychotics are frequently used to control behavioural and psychological symptoms of dementia (BPSD) and for the treatment of insomnia. ▸ Antipsychotics have the potential for considerable harm, including an increased overall risk of death, cerebrovascular adverse events, extrapyramidal symptoms, gait disturbances and falls, somnolence, edema, urinary tract infections, weight gain, and diabetes; the risk of harm is higher with prolonged use and in the elderly. ▸ A systematic review of antipsychotic deprescribing (dose reduction or discontinuation) in patients taking them to control BPSD failed to demonstrate negative outcomes resulting from deprescribing. ▸ The evidence in support of the effectiveness of atypical antipsychotics for insomnia is poor and of low quality. ▸ This guideline recommends deprescribing antipsychotics in elderly patients taking them for insomnia and in adults who have had an adequate trial for BPSD (ie, behaviour stabilized for 3 months or unresponsive to treatment). ↵* Descriptions of contributors’ expertise, roles, and conflicts of interest; the narrative summary of findings and related references; the GRADE evidence tables; the ranges of frequency ratios of harms; and an easy-to-print version of the algorithm are available at www.cfp.ca. Go to the full text of the article online and click on the CFPlus tab. Dr Farrell received research funding to develop this guideline; received financial payments from the Institute for Healthcare Improvement and Commonwealth Fund for a deprescribing guidelines summary; and from the Ontario Long Term Care Physicians Association, the Ontario Pharmacists Association, and the Canadian Society of Hospital Pharmacists for speaking engagements. Dr Bjerre received a financial payment from the Ontario Long Term Care Physicians association for a speaking engagement. None of the other authors has any competing interests to declare. La traduction en français de cet article se trouve à www.cfp.ca dans la table des matières du numéro de janvier 2018 à la page e1.
. The efficacy and safety of atypical antipsychotics for the treatment of dementia: a meta-analysis of randomized placebo-controlled trials. J Alzheimers Dis 2014;42(3):915-37.
. The evolution of psychiatric symptoms in Alzheimer’s disease: a natural history study. J Am Geriatr Soc 1996;44(9):1078-81.
. Dispensed prescriptions for quetiapine and other second-generation antipsychotics in Canada from 2005 to 2012: a descriptive study. CMAJ Open 2014;2(4):E225-32.
. New-onset treatment-dependent diabetes mellitus and hyperlipidemia associated with atypical antipsychotic use in older adults without schizophrenia or bipolar disorder. J Am Geriatr Soc 2012;60(3):474-9. Epub 2012 Jan 30.
. Polypharmacy and the geriatric patient. Clin Geriatr Med 2007;23(2):371-90, vii.
. Polypharmacy, adverse drug reactions, and geriatric syndromes. Clin Geriatr Med 2012;28(2):173-86.
. Antipsychotic use in the elderly. Toronto, ON: Ontario Drug Policy Research Network; 2015.
. Use of antipsychotics among seniors living in long-term care facilities, 2014. Ottawa, ON: Canadian Institute for Health Information; 2016.
. Guidelines 2.0: systematic development of a comprehensive checklist for a successful guideline enterprise. CMAJ 2014;186(3):E123-42.
. Withdrawal versus continuation of chronic antipsychotic drugs for behavioural and psychological symptoms in older people with dementia. Cochrane Database Syst Rev 2013;(3):CD007726.
. Atypical antipsychotics for insomnia: a systematic review and meta-analysis. PROSPERO. 2015. CRD42015017748. Available from: www.crd.york.ac.uk/PROSPERO/display_record.php?ID=CRD42015017748. Accessed 2017 Nov 20.
. Atypical antipsychotics for insomnia: a systematic review. Sleep Med 2016;22:13-7. Epub 2016 May 11.
. The dementia antipsychotic withdrawal trial (DART-AD): long-term follow-up of a randomised placebo-controlled trial. Lancet Neurol 2009;8(2):151-7. Epub 2009 Jan 8.
. Stopping antipsychotic drug therapy in demented nursing home patients: a randomized, placebo-controlled study—the Bergen District Nursing Home Study (BEDNURS). Int J Geriatr Psychiatry 2008;23(9):889-95.
. Quetiapine for primary insomnia: a double blind, randomized controlled trial. J Med Assoc Thai 2010;93(6):729-34.
. Risk of death with atypical antipsychotic drug treatment for dementia: meta-analysis of randomized placebo-controlled trials. JAMA 2005;294(15):1934-43.
. An economic evaluation of alternatives to antipsychotic drugs for individuals living with dementia. Coventry, UK: Coventry House; 2011.
. Caregiver burden: a clinical review. JAMA 2014;311(10):1052-9.
. Effect of second-generation antipsychotics on caregiver burden in Alzheimer’s disease. J Clin Psychiatry 2012;73(1):121-8.
. Fourth Canadian Consensus Conference on the Diagnosis and Treatment of Dementia. Recommendations for family physicians. Can Fam Physician 2014;60:433-8. (Eng), e244–50 (Fr).
. National guidelines for seniors’ mental health: the assessment and treatment of mental health issues in long term care homes (focus on mood and behaviour symptoms). Toronto, ON: Canadian Coalition for Seniors’ Mental Health; 2006.
. Normal sleep and sleep hygiene. Canadian Sleep Society; 2004. Available from: http://giic.rgps.on.ca/files/normal_sleep.pdf. Accessed 2017 Nov 20.
. Patient barriers to and enablers of deprescribing: a systematic review. Drugs Aging 2013;30(10):793-807.
. A 6-month, randomized, double-blind, placebo-controlled pilot discontinuation trial following response to haloperidol treatment of psychosis and agitation in Alzheimer’s disease. Int J Geriatr Psychiatry 2011;26(9):937-43. Epub 2010 Dec 28.
. A 3-month, randomized, placebo-controlled, neuroleptic discontinuation study in 100 people with dementia: the Neuropsychiatric Inventory median cutoff is a predictor of clinical outcome. J Clin Psychiatry 2004;65(1):114-9.
. A randomised, blinded, placebo-controlled trial in dementia patients continuing or stopping neuroleptics (the DART-AD trial). PLoS Med 2008;5(4):e76.
. A randomized, placebo-controlled trial of the discontinuation of long-term antipsychotics in dementia. Int Psychogeriatr 2002;14(2):197-210.
. Assessment scales in dementia. Ther Adv Neurol Disord 2012;5(6):349-58.
. Instruction manual for the Cohen-Mansfield Agistation Inventory (CMAI). Rockville, MD: The Research Institute of the Hebrew Home of Greater Washington; 1991.
. Clinical guideline for the evaluation and management of chronic insomnia in adults. J Clin Sleep Med 2008;4(5):487-504.
. British Association for Psychopharmacology consensus statement on evidence-based treatment of insomnia, parasomnias and circadian rhythm disorders. J Psychopharmacol 2010;24(11):1577-601. Epub 2010 Sep 2.
. American Geriatrics Society 2015 updated Beers Criteria for potentially inappropriate medication use in older adults. J Am Geriatr Soc 2015;63(11):2227-46. Epub 2015 Oct 8.
. Assessment and treatment of pain in people with dementia. Nat Rev Neurol 2012;8(5):264-74. Erratum in: Nat Rev Neurol 2013;9(7):358.
. EFNS guidelines for the diagnosis and management of Alzheimer’s disease. Eur J Neurol 2010;17(10):1236-48.
. Guideline watch (October 2014): practice guideline for the treatment of patients with Alzheimer’s disease and other dementias. Arlington, VA: The American Psychiatric Association; 2014.
. Recommendations of the 4th Canadian Consensus Conference on the Diagnosis and Treatment of Dementia (CCCDTD4). Can Geriatr J 2012;15(4):120-6.
. Antipsychotics in dementia: best practice guide. Dunedin, NZ: Best Practice Advocacy Centre New Zealand; 2009.
. Dementia: supporting people with dementia and their carers in health and social care. Manchester, UK: National Institute for Health and Care Excellence; 2015.
. Choosing Wisely: five things physicians and patients should question. Philadelphia, PA: Choosing Wisely; 2013.
. Systematic appraisal of dementia guidelines for the management of behavioural and psychological symptoms. Ageing Res Rev 2012;11(1):78-86. Epub 2011 Aug 10.
. Thirteen things physicians and patients should question. Toronto, ON: Choosing Wisely Canada; 2015.